Origin led me on a rollercoaster of emotions. The nervous anticipation when I started it - could it still be as good as the previous books in the Lux series? Then the pain and suffering Katy goes through had me biting my nails in desperation. The adorable romance had me smiling nonstop and squealing over Daemon. And that cliffhanger ending nearly had me in tears. Basically, it was all kinds of awesome. Well...what else is there to say about this series that hasn't already been said? If you somehow have been living under a rock in the blogosphere and have not yet read this series, DO IT NOW. It's so unbelievably good, and definitely the best YA book about aliens. Also one of the best books of all time, period. 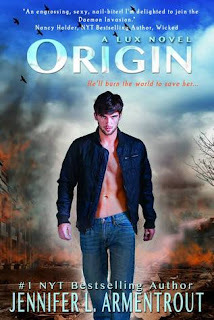 And if you're already a fan, then you're in luck, because Origin is every bit as good as the other books - if not better. What I loved about Origin is how it brings everything to a whole new level. Opal, the third book, was absolutely fantastic, but there weren't as many jaw-dropping moments and revelations as in Origin. In this book, we get so much more insight into the bad guys and their questionable motives, Daemon and Katy's relationship is pushed to the test, and there's a seriously emotional ending that will probably make you cry. It's just nonstop action. This is how you do plot development, folks. Of course I love Katy and Daemon as much as ever. Katy's character changes after the events of her capture in Opal, but oh I loved her and just wanted to hug the poor girl. And can I say, I certainly love that the book is also from Daemon's POV. His viewpoint is always hilarious thanks to his ironic sense of humor. So if you haven't read Origin yet, do so. The stakes are raised in a terrifyingly good way that has set things up perfectly for the showdown in the final book. I can't believe this series is almost over. *sob* Go read this, but be prepared for a rollercoaster of emotions!